Mani Shankar Aiyar had called the Prime Minister a "neech aadmi" on Thursday costing him primary membership of the Congress, which rushed into damage control mode. New Delhi: Hours before Gujarat votes in the first phase of assembly elections, Prime Minister Narendra Modi signaled again that the war over suspended Congress leader Mani Shankar Aiyar's "neech" slur against him is nowhere near an end. At an election rally he said even Congress president Sonia Gandhi has used the word against him, attributing what he called their "hatred" of him to his modest origins. "They have not called me 'neech' for the first time yesterday. Mrs Sonia Gandhi and her family members have used it too. Why am I 'neech' - because I was born poor, because I am of a lower caste, because I am a Gujarati? Is that why they hate me?" 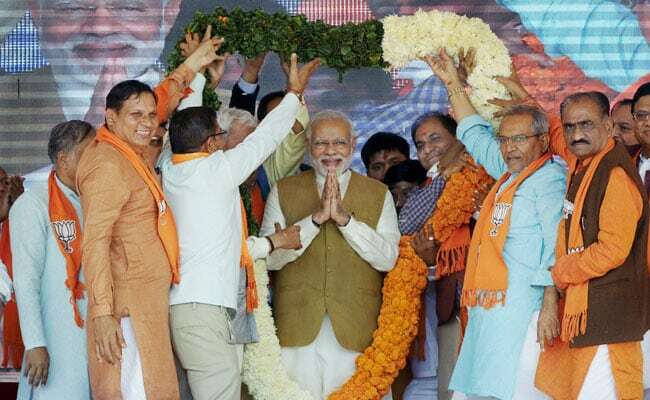 PM Modi said at a rally in Himatnagar in the state's Sabarkantha. He then recalled name-calling by various Congress leaders listing them by name - national leaders, state leaders - and asked, "Where is the decency in the language Congress leaders have used for me? What did I do to deserve this? Is it my crime that the people of India have reposed their faith in me?" Mani Shankar Aiyar had called the Prime Minister a "neech aadmi" on Thursday costing him primary membership of the Congress, which rushed into damage control mode. But PM Modi and top BJP leaders have, with a stream of statements since yesterday, ensured that the pressure on the Congress has not eased ahead of the crucial voting tomorrow. They have accused the Congress of a casteist attack, stressing on his credentials as a self-made leader as opposed to the Congress' Gandhis, who owe their power to dynastic politics. Soon after Mr Aiyar's comment yesterday, PM Modi exhorted his home state Gujarat not to respond to the slur against him with words or tweets. "Those pained by such a mindset and who want to take revenge, show it on voting day, on December 9 and December 14," he said, using the word "neech" many times in a speech less than an hour long. At another rally in north Gujarat this morning, PM Modi alleged that Mani Shankar Aiyar had "given supari (contract)" on a visit to Pakistan "to get Modi out of the way" to end the deadlock between the two countries. Finance Minister Arun Jaitley has described the Congress' swift action against Mr Aiyar as a "strategic suspension," while law minister Ravi Shankar Prasad said "Proud of Indian democracy. Narendra Modi - a man born in poverty, by his hard work, honesty and record of governance is elected by the people as PM. He brings respect for India and Indians globally. He has been called neech. Surely the people will respond to this." Rahul Gandhi, who was also campaigning in Gujarat today, said he suspended Mr Aiyar immediately as "the Congress respects the Prime Minister's post." Mani Shankar Aiyar who has attributed his use of the word "neech aadmi" for the PM to his poor command of Hindi, today said, "If any damage has been done to Congress because of what I said or did then I am saddened by it. I had no such intention. I am confident that under the leadership of Rahul Gandhi we will win in the Gujarat elections. He said he was ready to "accept any punishment that the Congress party wants to give me."